Recently, Torley went looking for foliage in-world that grew and developed over time, because by default, the trees and shrubs of SL are pre-fabricated and unchanging, like so many chickenwire and canvas sculptures that set decorators use for live productions of Midsummer Night Dream. Someone had already created a whole school of clown fish, after all, even programmed them to have genes and pass those on to their offspring. 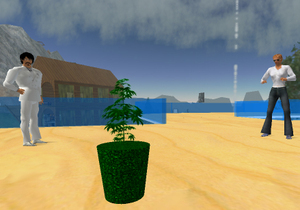 Surely a Resident had scripted artificial flora that responded to sunlight and water, and grew? Unsurprisingly, Torley finally found what she was looking for. Also unsurprisingly, the first credible genus of artificial plant life to appear in SL is cannabis-- leafy, green, the weed with roots in hell (but legal for medicinal use in the state of California). It's yet another demonstration of Gibson's adage, "The street finds its own uses for things", but as I learned, the project's a bit more ambitious than a mere stoner gimmick. 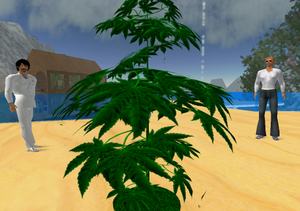 Torley's account is here; unable to resist, I had to check out the cannabis of Dave and Robbie Dingo for myself, and get their secret for making it grow, and grow so huge. 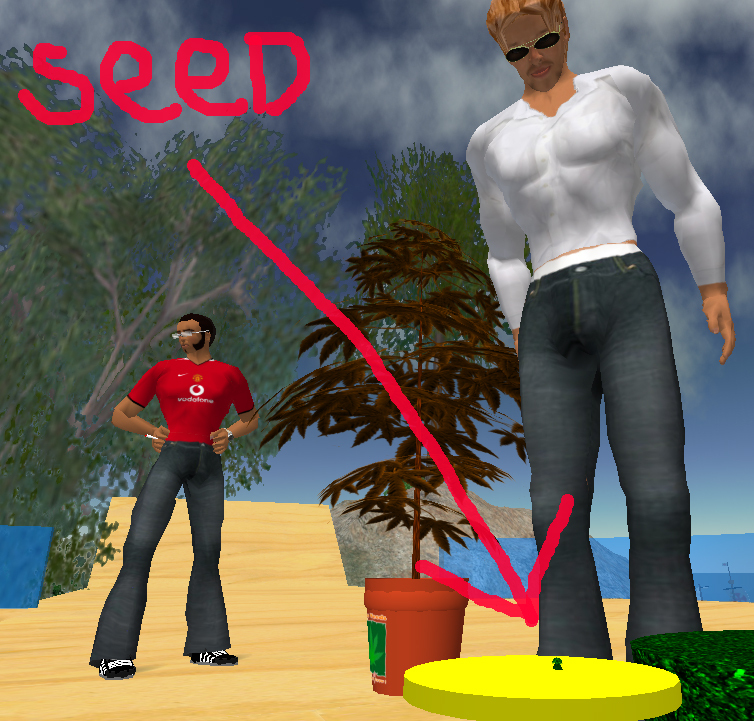 After the break, their story, and time-lapse screenshots of the growth process-- which starts, as it turns out, with a seed and a dude praying for rain. The plant's system (scripts, root and leaves, sound effects, etc.) is contained within its pot, and though you can't usually see it beneath the dirt, it starts as a seed at the base. To demonstrate what's usually a one month process in real time, Robbie jiggers the scripting, so I can watch it all play out in a few minutes. "OK," Robbie explains, "so all parts [of the plant] are self-contained, and linked... all parts start [at] 0.01 x 0.01 x 0.01 [meters]." When you first touch the pot, "basically a timer is set, although there is variation in day time and night time growth spurts." "The rotation and scale is pre-determined at the moment [of first touch]," Robbie continues. This creates unique variations in the plant's shape-- sort of a poor man's fractal pattern that only becomes apparent later on during the one month growth cycle. "When you first touch it, [the specific form] will be set for that plant," Robbie says. "After about 45 minutes (on the one month variety), you will see a little stem pointing out of the earth. After about one and a half days, the Z scale will have reached a point that the other branches will start to appear." I ask Robbie what happens if you don't water your plant enough. "Well, we toyed with the idea of it dying. But in the end, [we] opted for it not growing." 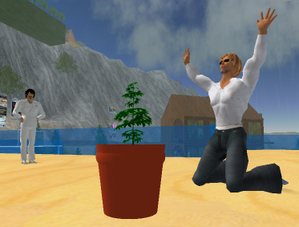 Nothing worse than forgetting to log into SL for awhile, and coming home to a withered pot plant. But you can give your cannabis a name, and like a hippie tamagotchi, when it's running low on water, your plant will send you an urgent Instant Message, to remind you to start praying. "[T]here is another counter [for water level]," Robbie continues. "In the daytime, the counter is decremented. This represents water loss, and is also set to change the RGB value [of the leaf prims] from Green to Brown, so you can see the leaf change color before you know it needs water. Then you can touch [the pot] every now and then for a status report showing hydration, height, percent of full size." 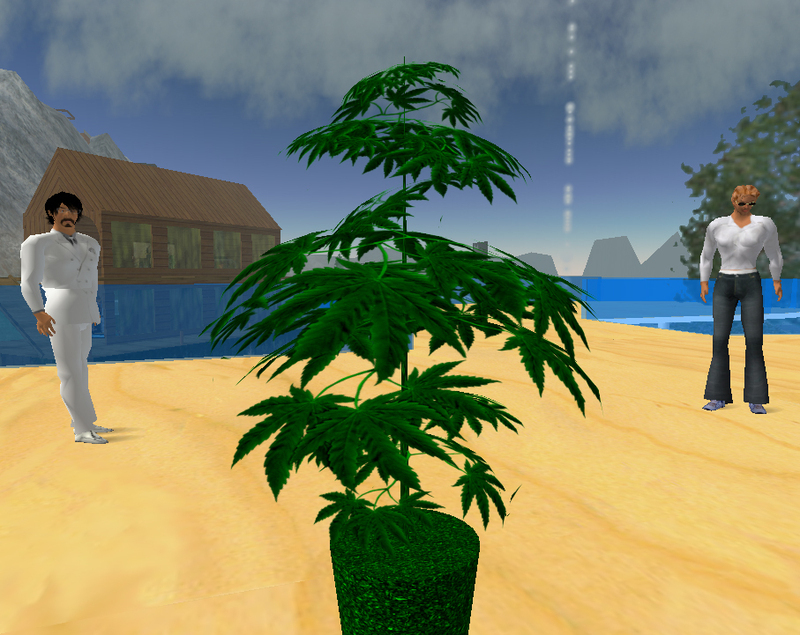 The Dingo brothers' cannabis has simulated photosynthesis, of a sort-- the plant checks to see what time it is, and if it's day in Second Life, it grows more. The system also creates a particle display of thunderclouds and rain-- so the pot contains a microcosm of a plant's entire ecosystem, with a bit of voodoo thrown in. And after the cannabis gets over twenty feet, all I can do is stare. "Geez," I finally observe, "You could keep all of Humbolt supplied with this plant!" "The fact that this proptotype is a cannabis plant is neither here nor there," Robbie tells me. 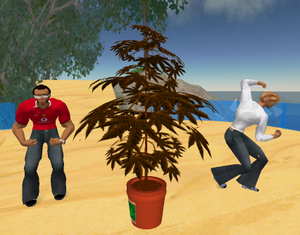 "It was just a fun place to start... We wanted to pick a plant with a certain 'something' about it. It's the sort of plant that some people might say, 'Hey check my little plant out', where they probably would not if it was a carrot... We could have easily opted for an orchid or rose, but thought we would wait 'til we had done one that does not flower." Simulating that will be more complicated, but the Dingo brothers are currently developing a sunflower that will not only bloom, but turn to face the sun. "Eventually," says Robbie, "we hope to add more to randomize the appearance of each plant's color, scale, shape, and lifespan, and have it more affected by as many external influences as possible, (e.g., wind, water, sunlight, music-- and conversation, perhaps?)" Eventually, he hopes for a time when SL landowners will not decorate their land with prefabricated plants, but instead sow seeds, and let their landscape develop over time with some care and genuine sense of nature. 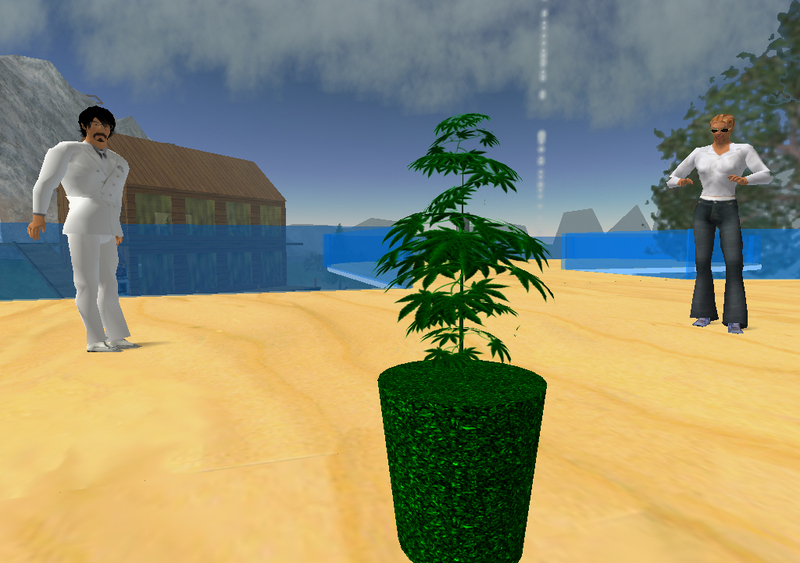 Besides its merit as another experiment in virtual world artificial life, it's actually surprising that it's taken so long for a Resident to create a virtual pot plant. Way back in late 2003, Oneironaut Escher built an entire cannibis theme park, but that was more an interactive political installation-- albeit one with a bong-shaped roller coaster. Still, I wonder what the San Francisco-based Linden Lab will say, if the Dingos' cannabis begins to spread across their world like, well, like weeds. The company's Community Standards forbid "broadly offensive" content that's viewable in open areas, and the domestic cultivation of this particular plant is still illegal in most parts of the world. Robbie Dingo shrugs. "I'm sure they will not be too worried. In fact, without dropping any names, we know of several Lindens growing the plants as we speak!" I wonder how much these guys read up on morphogenesis before creating this thing...various system for developing forms are better understood day by day. It would be cool to see someone implement them in SL. See Goodwin, B., "How the Leopard Changed Its Spots." i love to smoke weed!!!! 4:20 all day baby!!! why dont you add sl-links? I got the growing pot plant as a gift for xmas and it's on my list of "my very favorite things in SL". My compliments to Dave and Robbie. It's refreshing to see a professionally done product like this to show that we're not all stereotypical stoners just because we enjoy the benefits (either medicinal or recreational) of the cannabis plant in RL. And as far as esthetics go, the marijuana plant is one of the most beautiful fractal creations in nature. Good choice! Hey, i need some quick tips on growing your plant. or can you let them get as big as you want. "Broadly offensive" to many RL people is what drugs are. This is part of the dark side of SL, and lends credence to suspicions about it. 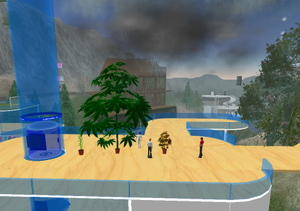 One, that the scripters and builders of SL tend to be amoral and anti-social. 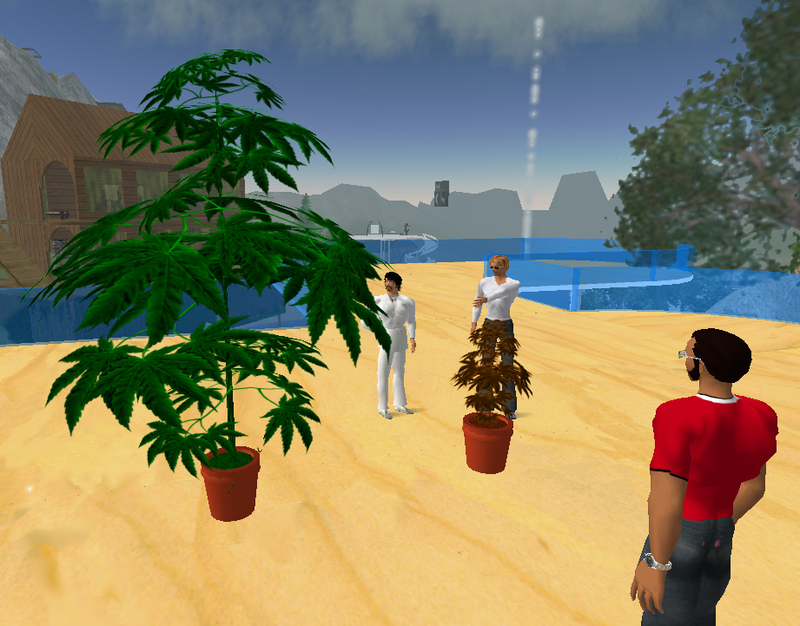 Two, that SL "hippie" venues are fronts for the drug trade. Using the same script on a sunflower would have been more socially responsible and better for the image of SL. I sugest you look some data up before you make such declarations. There's no such thing as a relation between weed and principles. There's only low social levels and politic contexts in some countries that make legal-pot impossible to apply. There are cientifically proven health benefits from using this plant all around the world, and NOT only in California, most of the states are starting to apply pro-cannabis/hemp regulation and taxation policies to increase recaudation. Also, there is cientific evidence proving that pot will not lead people to the use of stronger and more dangerous drugs. War against drugs takes advantage of people ignorance about the topic. PS: sorry about the poor english, I spean spanish.